Roots of the Garden's EarthWays Center embody the leadership and educational resources of several environmental organization ancestors. The original non-profit EarthWays organization evolved in 1990 from the team that produced the St. Louis community's event to support the national celebration of the 20th annual Earth Day. That EarthWays organization shared office space with MERP (Missouri Energy Resources Project), a program of the Cooperating School Districts of Greater St. Louis, which had been providing energy and recycling education resources to schools in St. Louis and throughout Missouri since 1988. Inspired by the teaching success of MERP's Energy-Efficient Dollhouse program, the EarthWays organization leased and extensively renovated an 1885-vintage city house to demonstrate modern resource conservation options in the experiential context of a real building. This was remarkable work, considering how early this effort was regarding the research-leading efforts of sustainable building design and operations. After a 2-year, half-million dollar upgrade, this demonstration facility, the EarthWays Home, opened for public tours and classes in 1994. For several years MERP used the EarthWays Home as a field trip location for all of its school program. At a major crossroads for both organizations in 1997, the original EarthWays organization folded and MERP assumed operations of the EarthWays Home. In November, 2000, Dr. Peter Raven, the Garden’s President Emeritus, facilitated the full integration of MERP’s programs and staff with the facility of the actual EarthWays Home into the Missouri Botanical Garden, creating the *EarthWays Center as the Garden's sustainability division and an offsite location for the Garden. 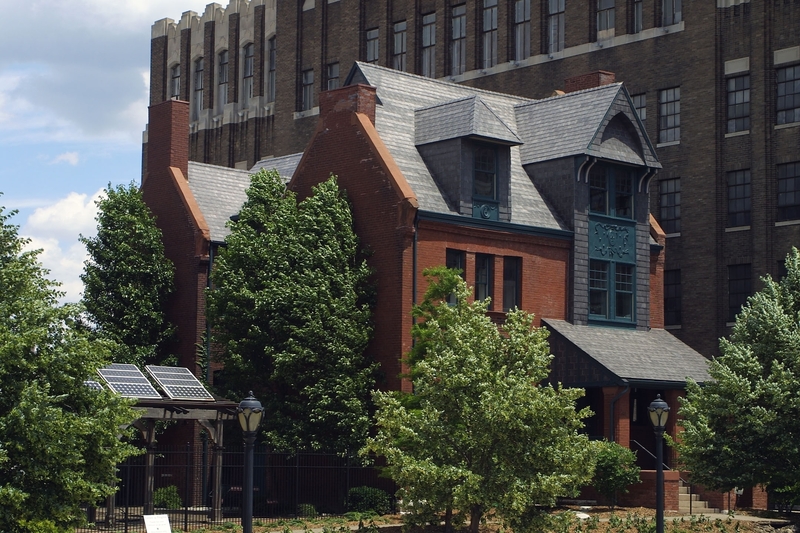 Promoted as one of the Garden's Family of Attractions, the EarthWays Center on Grandel Square in the mid-town St. Louis Grand Center arts district, engaged tens of thousands of adults and youth, businesses and municipalities with green living ideas and practices through tours, classes, summer camp, partnerships with many other organizations and events. An annual festival that has grown from modest beginnings at the EarthWays Home site in 2002 has become one of the Garden's Annual Signature Events, the Green Homes Festival. EarthWays Center staffs regularly lead sustainability-focused tours of the Garden's buildings and grounds and assist with ensuring the Garden builds and operates in a manner so we walk our talk and provide many excellent examples for the community of how to operate sustainably. Future plans include a potential new sustainability demonstration home actually on Garden grounds. *When MERP staff and programs first joined the Garden the division’s name was Gateway Center for Resource Efficiency, housed out of the EarthWays Home. These names were eventually dropped and the unified name of the programs, projects, staff and efforts were collectively called EarthWays Center.